Sodium carbonic acid import GOST 4201-79. 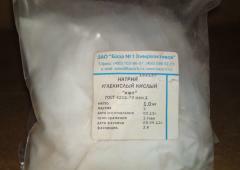 Sodium carbonic acid GOST 4201-79. Reactants. Acid sodium carbonate represents white crystal powder, water soluble, slaborastvorimy in ethyl alcohol. Acid sodium carbonate is non-toxical, is not explosive, not fire-dangerous. Unbelievable price on Sodium carbonate acid in Sumqayit (Azerbaijan) company Fuad kimya servis, OOO. Wide choice of quality products at affordable prices.